Note: the Aegagropila linnaei is not actually a plant, but an alga. 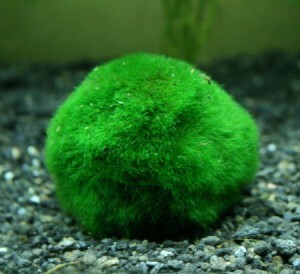 It is often used as decoration in aquariums, as if it were a plant. Its natural habitat is lakes, where thanks to the constant movement of the waves, it takes the form of a ball. Moving in all directions, allows it to receive the rays of the sun on all its surface. It prefers alkaline waters and clean, however rich of nutrients of organic origin. Being very adaptable to different conditions of light and temperature, it is easy to grow in the aquarium, you must turn it regularly, however if you want it to retain its classic spherical shape. It prefers temperatures not exceeding 24°C. and low lighting. The growth is very slow (something like 5 or up to 10 millimeters per year) and is observed only in aquariums with particularly favorable conditions. It may happen that dirt accumulates on its surface. In this case, if there aren't organisms that can keep it clean (eg. Caridina), you can rinse it by taking some water from the aquarium tank. It can also be grown in brackish aquarium, with a maximum salinity of 5-6‰. Vegetative propagation of Aegagropila linnaei can be done by dividing the balls into smaller pieces, which will become spherical with time, always bearing in mind, however, its very slow growth rate. It can also be grown attached to stones or wood, where it can form a thick carpet.